Toronto striker Bright Dike admits he has to improve if he is to stand any chance of making Nigeria's squad for the World Cup. United States-based Dike, who has recently returned from a long-term injury, scored his second goal in as many starts for the Super Eagles in Monday's 2-2 friendly draw against Italy. 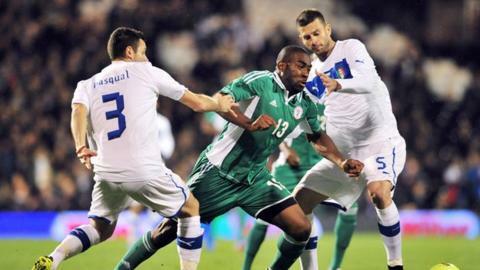 His first international goal against Catalonia in January was not enough to earn him a place in the 2013 African Cup of Nations squad. With his cousin Emmanuel Emenike, Brown Ideye and Shola Ameobi ahead of him in the pecking order, Dike is still hoping he can force his way on to the Nigeria plane for Brazil. "I'll keep working hard because there's big competition for places in the squad," Dike told BBC Sport. "The team is doing well and I've always been confident that my time will come. "I've been extremely patient and working hard and I feel honoured to get another chance. "The goal [against Italy] is just testament to how hard I've been working and I'll work even harder to make sure I go to Brazil with them." Competing against established European-based players, Dike who plays for Major League Soccer side Toronto FC has his work cut out. With no scheduled competitive game for Toronto until March, selectors are hoping the Oklahoma native will start weighing up off-season loan possibilities in January. "I will not be taking a break for longer than a few weeks I will train with a team in Europe which is still to be decided," Dike said. Dike knows he has to stay active in the off-season and keep making progress to land a place in his country's squad for the 2014 World Cup. "I'm not only competing with my cousin [Emenike]. There are other talented strikers and you can't give up but keep fighting," he said. "I can't personally change the MLS schedule to suit myself, so all I can do is work hard like others and make a good impression. "You have to compete at all levels and no matter if you are the last man or the first. "Everybody is going to have to become better just so they play well in the World Cup, because the the job is not done yet, it's just the beginning." Dike is one of two MLS-based players to have played under Stephen Keshi since he took over as Nigeria coach in November 2011. Seattle Sounders' Obafemi Martins played for the Super Eagles in a World Cup qualifier against Kenya in March just days after completing a move from Spanish side Levante.